HARTFORD, Conn. – Ja Morant and Zion Williamson were AAU teammates nearly five years ago on a rag-tag outfit known as the South Carolina Hornets. They weren't even the highest-regarded players on the team. But in three months, there's a strong likelihood that the duo will be shaking Adam Silver's hand five minutes apart at the top of the NBA draft. Morant, a 6-foot-3 sophomore, and his No. 12 Murray State teammates treated No. 5 Marquette like they were just another Ohio Valley Conference walkover in the opening round of the NCAA tournament on Thursday afternoon. Morant registered a triple-double in one of the most dominant performances in NCAA tournament history, leading Murray State to an 83-64 over the Golden Eagles. Many had picked the upset in their bracket, but no one could have imagined the tenor. 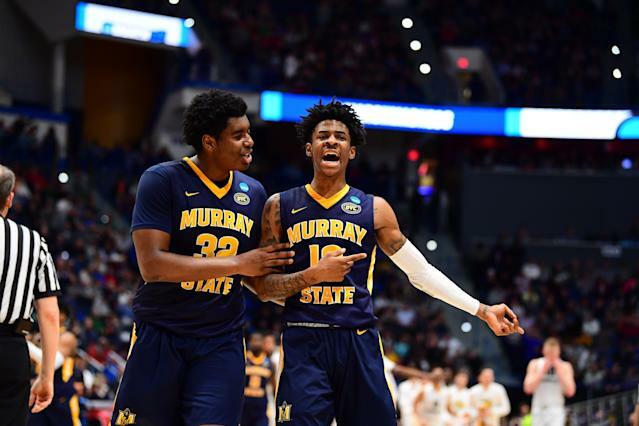 Murray State won its fourth-ever NCAA tournament game, and Morant officially completed his box out of Popeye Jones for the school's best-known player. In the matchup with Marquette sniper Markus Howard that everyone wanted, Morant perhaps cemented himself as the No. 2 pick in the NBA draft behind his old AAU running mate. "He could be like D'Angelo Russell," predicted an NBA executive, "and jump up to No. 2." Morant lobbed to his teammates off double-teams and drove ambidextrously to the hoop – Marquette coaches preferred him going to his right, his alleged strong hand. He controlled the game as if he held it on a yo-yo and devoured a stage that was hyped, promoted and predicted to be his. Somehow, he delivered even more. 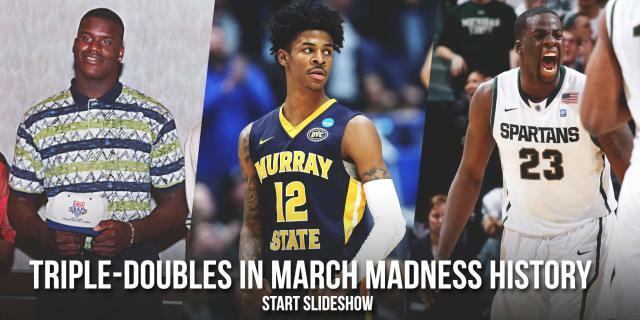 As Murray State's second-half lead ballooned to as many as 22, the only drama remained was whether Morant would register a triple-double. He finished with 17 points, 16 assists and 11 rebounds (all defensive), leaving the fans of the point-guard depraved Suns salivating. Fans at the XL Center chanted "Triple-Double," as he secured the first in the tournament since Draymond Green in 2012. He finished two assists from the all-time single-game assist record of 18 by UNLV's Mark Wade. Want a shining moment? That would be Murray State forward Darnell Cowart catching a ball in the high post and dropping it sidedoor to a cutting Morant. With a full sprint of momentum, the 6-foot-3 Mortant hammered home a two-handed dunk that left Marquette's 6-foot-9 Joey Hauser on the business end of a dunk that'll live on for years in posters throughout Southwestern Kentucky. Morant was one of four Racers in double figures, as he simply elevated Murray to an evisceration of Marquette. When is an upset not an upset? When 40 percent of America picked it in their Yahoo Sports brackets. When a team that entered the game having lost five of six continues its tailspin. And, the biggest tell would be that if the teams removed all logos and were playing shirts and skins at the Hartford YMCA, you'd have thought Murray State was the higher seed. This is the first NCAA win for coach Matt McMahon, who had a team that didn't flinch all afternoon. Murray State improves to 4-16 in school history in NCAA tournament games. The Racers will face No. 4 Florida State on Saturday, and Morant's presence will turn it into another event. Howard started the game strong for Marquette, scoring 15 points in 16 minutes before sitting the final 4:40 of the first half. He never quite heated back up again, as he finished with 26 points on 9-for-27 shooting. (Morant's 17 came on nine shots.) Marquette entered the game on a slide and could never quite get their footing. Murray State led by seven points at the half, but Morant dominated it so casually that it didn’t seem that close. Morant is everything that's right about the NCAA tournament wrapped up in a 6-foot-3 ball of adrenaline. He's the small-school kid with a high profile and low ego. He's the overlooked kid who's appreciative of where he landed, instead of bitter about the logos and leagues that overlooked him. "No one really sponsored us," said Ole Miss guard Devontae Shuler, the most heralded member of their unsponsored AAU team. "We went to Under Armour events, they would invite us to some of their events but we never had Under Armour logos on our jerseys." Morant's rise isn't surprising to those in the NBA. The teams that did their homework saw him earlier in the season against top-flight competition like Alabama, Auburn or Belmont. There's a reason he kept escalating up the draft boards all season. Now, the only person left to jump is his old buddy Zion. That seems like a tall task. But rest assured, Ja Morant has left America waiting to see more. And against No. 4 Florida State on Saturday, the promise of his ascendance is the buzz of the tournament.